Even though I have been doing this for four and a half years, I still found it unnerving when, after typing ‘UK media bias EU’ into Google, one of my own pieces comes up on the first page. The gist of that (mid-April) post was if the broadcast media stuck to their ‘shape of the earth: views differ’ policy, our EU membership might disappear as a result. What I took as given in making that comment is the partisan behaviour of the non-broadsheet press. In a more recent post I argued we should not take this as given. Martin Kettle subsequently spelled it out very well here. He wrote “Remain or leave? Politics or the press? The question on Thursday, just as Humpty Dumpty said, is which is to be master.” But is this kind of sentiment just a form of Guardian writer/reader transference: blaming the messenger of working or lower middle class views because they abhor those views? Is this, as comments on my own post suggested, just the tabloids reflecting the views of their readers? Forget the straw man of newspapers telling readers what to do. The concern is not with which side newspapers formally endorse. It is about how stories are selected and portrayed. Like the recent front page story from the Mail about migrants in a lorry saying “we’re from Europe - let us in”. Except they didn’t say that. Incredibly the Mail is not the worst offender for putting stories like that on its front page, as the montage below shows (source @kwr66 HT @mehdirhasan). It is sometimes said that telling facts is the job of the broadcast media, and newspapers are about opinion. Right now I would turn that around. The broadcast media are so frightened of appearing biased that they describe clear falsehoods as simply ‘contested’. In the soundbite world they inhabit, that is as far as they go. They set up debates rather than explore issues. They broadcast opinions rather than facts: the opinions of politicians. In print you can go further: you have the space to present the facts and back them up. That is what the broadsheets at their best do. Facts like these get in the way of the Leave campaign. They would prefer an emotional rather than rational debate. Shamefully, they play on the emotions of nationalism and the threat of others. They will not tell their readers that there is no chance Turkey will join the EU in the near future because they want to use that false threat to generate fear - indeed vote Leave leaflets headline with this threat. And I have to say, as others have done, that those who distort facts to whip up such emotions for political gain have to take some responsibility for the tragic side effects of their actions. When politicians do this we can, in time, hold them to account. When the owners of newspapers do this it appears we have no recourse, and they can go on doing the same again and again. If there is an issue with ‘control’ in our country, it is not with Brussels bureaucrats but with a small number of press barons that wield such power without a trace of accountability. We need to find a way to ‘take back control’ of the means of communicating information. Declan Gaffney gives a nice account, in the context of stories about benefits, of how this can be done. In this mythical story of reader reflection, the owner of the paper only dictates the newspaper’s line because only he can truly sense the wishes of his readers. So when Murdoch instructs his journalists to write more anti-Miliband stories, it is because he just knows this will sell more papers. Another line apologists for these tabloids use is that readers are well aware of their paper’s political bias, and it does indeed seem to be true to some extent. But when these readers see no alternative source of facts (and most readers of these papers will not seek out alternative sources), the misinformation pushed by these papers sticks. Before anyone says ‘freedom of the press’, note that in the UK the broadcast media have to conform with a code that requires both impartiality and accuracy when reporting news. Does that mean our broadcast media is not free? That code is enforced by Ofcom. Why not apply something similar to news content in the press? 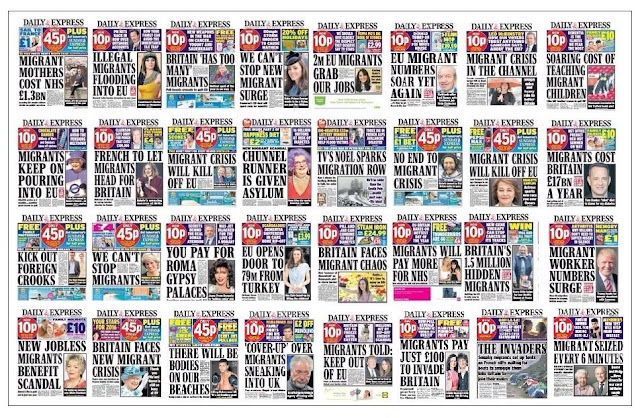 Postscript (26/06/16): one more piece of evidence for the distortionary impact of the tabloids is how biased the public's view is of key facts, and the bias all goes in one direction. The best part of the 'Turkey will join EU' story is that, for several decades, Britain has been in a military alliance with Turkey! Given the loose cannon it has as a leader, if I were forced to choose I would rather Turkey was in the EU instead of Nato. Turkey on the news it will be in the EU within a decade: "Gobble." This is the more plausible reading. “They will not tell their readers that restricting immigration will make it less easy for them to see their GP..” Well I suggest the tabloids are quite right not to tell their readers that, and for two reasons. First, if immigration AS A WHOLE is restricted, but we let in migrants with skills we need, then “restricting immigration” will not in fact “make it less easy” to see a doctor. Second, I imagine tabloid readers are perfectly able to work out that even if we do import fewer doctors, that can be compensated for, in due course, by training more natives as doctors. Indeed, if importing a large proportion of the medical staff that we need is such a brilliant idea, why not extend the principle to every other skill? We could stop training bricklayers, car mechanics, plumbers, economics professors, you name it, and import three times as many skilled people as we currently do. Imparting skills costs taxpayers a bomb. Why is it a virtue to rob taxpayers in other countries? I suggest the tabloids and their readers are right: every country should train approximately the number of skilled people it needs. I was not thinking about overseas doctors so much as the fact that there would be less money to pay for any doctors, because migrants help the public finances. Restrict migration and you cut taxes by more than you reduce demand on public services. Simon I don't know whether you read Polanyi, but in certain cases it pays to train up your own labour, rather than rely on foreign labour. Remember if you could get the native unemployed to work, there would be less resentment, people will feel the elite are on their side, and you know what, by working they will be paying taxes! A problem that may arise with globalisation is that it can create a dependence on foreign production, capital, and labour, and in the case of labour this dependence reduces the incentives and the ability to deal with structural problems, like long term unemployment, underemployment or big inequalities in income and wages, in the labour market. It is a good example of how economics and political science should not be separated. Having people feel they are in the same boat can actually have good economic outcomes, as well as social ones. There is not necessarily an efficiency-equity tradeoff. By the way how are things at Oxford. Are you doing a good job at getting a high proportion of native economics PHDs and training up natives to be future economics professors? "there would be less money to pay for any doctors, because migrants help the public finances." There would not be. That is a lie. Is it so difficult to accept that the UK is literally built upon and shaped by waves of countless immigrants, whose immediate decendents ( and themselves if still alive of course) constitute the UK population. Perhaps you are referring to pre- Roman invasion natives? Who exactly do you refer to? "I was not thinking about overseas doctors so much as the fact that there would be less money to pay for any doctors, because migrants help the public finances. " Great, so as soon as the government is short of taxes, it will just bring in a few more immigrants to "help public finances". This is exactly the kind of simplistic thinking which got us to a 50%+ vote for Brexit in the first place. I suggest that economists have another look at the "immigrants are good as they pay taxes" argument. Surely, they must understand it is more complicated than that, and leave these simplistic sound-bites to the tabloids. The question of training staff is a godd point raised by Ralph. Somewhere in the 80's I think, training your people turned from an investment into an expense. The direct result of this lunacy is the chronic mismatch between skills and available jobs we witness today. The desirability of the UK training more doctors and nurses is not disputed. What is pure fantasy is that voting Brexit will bring it about. The chances are much higher that the NHS would go - just look at the views of those running Leave. "They would prefer an emotional rather than rational debate. Shamefully, they play on the emotions of nationalism and the threat of others. They will not tell their readers that there is no chance Turkey will join the EU in the near future because they want to use that false threat to generate fear - indeed vote Leave leaflets headline with this threat." Also the emotional rather than rational has motivated political discourse for thousands of years and. whilst I'm not saying that your point is wrong, it is somewhat against the grain of history and indeed human nature. You also forget that most may not have either the time or the inclination to engage with these issues at a rational level. Now this may be no argument against trying to lift the level of the debate; I'm all for that; but it does mean that the ultimate relevance of this may be far less than you suppose. I really do not understand your point. Are you saying it does not matter that people are fed lies and they have no time to know they are lies. Are you saying it does not matter that sections of the press encourage fear of 'others', because this will have no influence? No, I'm not saying that facts don't matter or that we are fed lies but I am saying that you seem to think that it is possible to present the facts in a neutral way whereas I don't think this is really possible, outside of a simple bald statement. Your surprise indicates that you do not see yourself as guilty as others, whereas in some respects you are so regarded. This issue goes back in our country to Richard Hoggart's 1957 book 'The Uses of Literacy', where Hoggart fretted about the impact of popular culture on the reading habits on his own working class. If the 75s and above are largely pro-EU, but the 45-74 age group baby boomers are the ones who are the driving force for the anti-EU vote, it suggests that it is not just the newspapers bought but the life experiences of those people that has led to this generational caesura. The over 75s are the last of the rationing generation, the under 45s proportionally better educated. Let us hope they can together see off the majority culture of the 'aspirational class' which sits so angrily between them. We did have a big public inquiry into this issue, and an extended battle over implementing wholly reasonable press regulation aimed at raising standards of accuracy and accountability. That battle is not quite over, but the press have almost entirely won. And when I say 'the press' here, it must be stressed that as well as the Murdoch, Dacre and Desmond publications, regulation was also resisted by the 'quality' press. The Guardian's arguments were particularly specious, I have to say. I was peripherally involved in trying to find a way to get a good regulatory system implemented, but once Leveson's report was published the press collectively imposed an almost complete blackout on the issue in the hope the public would forget about it and politicians would succumb to their lobbying. What they did report was a combination of outright lies, character assassination pieces targeted at Hacked Off and other supporters of regulation. (Look at the Daily Mail's 10-page attack on David Bell, who gave money to the Media Standards Trust think tank and whom the Mail alleged was at the centre of a vast and sinister left-wing conspiracy.) After it became clear not even the Guardian, the FT, Private Eye or any of the local press we're going to break ranks and support the establishment of a Leveson-compliant regulator, it became extremely hard to make any progress. After Leveson's report was published, Conservatives quickly swung behind the right-wing proprietors, but Ed Miliband did not, and that definitely intensified the hostility of the press towards him, though I'm sure they would've been plenty hostile anyway. There is still an effort underway to get proper regulation through Jonathan Heawood's IMPRESS project, but again, you naturally won't read anything about it in the press. I could go into much more detail about the totally cynical and deceitful campaign against Leveson and the pro-regulation effort, but suffice to say it was enough to convince me pushing for regulation or higher standards just isn't enough: many of these institutions need to be taken out of the hands of their current owners and new forms of social ownership devised for them. In the case of some titles, it's probably too late even for that since they've been run into the ground for the sake of short-term profit (eg the Desmond titles, which can barely be called newspapers at this point). What certainly can't be allowed is that they take down the BBC with them: since the election, with the threat of press regulation largely dissipated, getting the government to force the BBC to scale back its news operation, particularly online, has been the focus of the press's lobbying agenda. Again, I include the Guardian in that. It must be resisted strongly, and a new reform agenda to give us the journalism we deserve needs to be developed. Labour could do with a media reform advisory group to mirror its economic policy one, I'd say. I did not mention Leveson because I wanted to focus on the points I made, but you are absolutely right that what has happened since the Leveson report indicates both the power and arrogance of the UK press. Thanks for your comment. Simon, you make some good points but enforcing balance on newspapers is not going to work. What about websites, facebook etc. Its far too late now for this. We are all to blame in varying degrees. We (and here I speak for liberal / left) got into a comfortable habit of denigrating opponents, as either stupid or wicked. It turned out that our words had consequences too, trust has collapsed. After all did we not claim Cameron was desperate to inflict suffering on the disabled (labour party political). Is it any wonder many do not believe him? Have we not claimed Osborne fiddles figures and is incompetent, why trust him now? For too long, we all pretended that society's problems can be easily solved if only the people in charge were honest or intelligent rather than incompetent and wicked. The shoe fits both sides, the demon eyes used by the Tories, the monstering of Ed Milliband etc. So now we have created the soil in which the truly awful has taken hold. If as I believe Brexit will result in a significant economic problems, what comes next? Deportations I think, after all the Brexit wave is not about waiting to 2020 to reduce immigration to 180K a year (the current number from outside the EU who have been given permits based on skills!). I have no solution to any of this. Perhaps being badly burned will teach us a lesson but I doubt it. Magical thinking coupled to a convenient other has proven a durable formula. Once we have lost our economic and political stability, welcomed with open arms the strong (wo)man to 'get it sorted', those of us who for years mocked that very same messy compromising stability will look back wistfully. I disagree. I do not really see the logic in you saying 'it is far too late'. I also do not think we are all to blame for this. I have never claimed Cameron was 'desperate to inflict harm on the disabled', and to be honest I cannot think of many who have. (You do not give a link to the PPB you say did this.) Saying that his policies would harm the disabled is a very different thing. So was this a calm statement of the choices that faces that those that govern, or a case for higher taxes whilst maintaining growth? Its far too late because hate has been unleashed, if you can stand the pain read some of the pro-brexit websites. I have been involved in campaigning and I know first hand and I know an MEP who tells me (s)he and colleagues are shocked by and frightened by what they hear on the doorstep. If we deal with newspapers, will we deal with radio shows, on line sites too? I say it will achieve little because this poison has taken root in pretty much all Western Democracies. Do they read the Express in France or Idaho? The Sun is not a big seller in Amsterdam. The whole no nothing rage against conspiracy of the elite meme has slipped the leash. There is a significant minority who would burn the whole house down. I am not (clearly) a writer of the calibre of Alex Massey (I don't have a history of his all articles) who hits the nail on the head. This is not going away and I really fear what happens next. I do not know you (although I enjoy your website). Perhaps like me you have been out leafleting and campaigning, if not its worth a try going around what are called low income areas. I hope that we can turn this around and I am not for giving up, but I do think its too late. Last year, I had a little minor media exposure as head of a UK university team that had concluded a successful collaborative research project. There were TV news articles about our work and, subsequently, articles in pretty much every UK national newspaper. These newspaper articles leant heavily on a press release from my University. The Mail copied this release more or less word for word. Except for a paragraph which explained that my team was just one of a 7 nation consortium, working on a project funded by the EU Framework 7 programme. Instead, the Mail, incorrectly and inexcusably in light of the facts set out in our press release, stated that my research team at my UK university had conducted the entire research programme. They made no mention of the EU partners or funders. Lying and misinforming on the subject of the EU is so ingrained in the editorial spirit on The Mail that they will even do it on such a trivial matter as that one. I wonder where they would draw the line? Interesting (although not surprising). Thanks. "Power without accountability in our serious press"
On Brexit I think there has between a world of difference between the tabloid and broadsheet press. If you want to govern you have to pay attention. The broadsheet press represents the political class that brought us here. The fish rots from the head, not the tail. And who could forget that in the French referendum the "non" was swung by the media - oh no wait!!! I know! the universal support of the media in Holland was responsible for the "Ja" vote to the Constitution - oh no wait!!! Sooner or later prof. you are going to have to acknowledge that there is something else going on here. The politics of behind closed doors by an inner circle has moved from being widely distrusted to being actively loathed. The inability to flush away bad policies with bad policymakers in the normal electoral cycle has clogged up Europe's political drains and has led to policy stagnation and unprecedented levels of policy capture by vested interests. As you have frequently noted it has also led to political and economic repression for tens of millions of Europeans. You are right. The distrust of the electorate with the political establishment is now so great that it would be impossible for a government that reduced incomes and cut public services to survive - oh no wait. Of course there are other things going on here, and of course the media is not all powerful, but who ever claimed otherwise. That should not be an excuse to ignore their very real influence. If the policy is imposed by treaty or bi partisan lock out then governments that reduce incomes and cut public services can be removed but the policy cannot be removed. Bar Germany there has been a change of government everywhere in the eurozone - but there has been no change in policy. Policy is set in treaty concrete, the definition of inflexibility & disenfranchisement. You know this - you have even written about it. Murdoch & Rothermere are not the svengalis behind this populist outbreak - misgovernment by treaty prerogative is to blame. Today's harlots who enjoy power without responsibility sit in Brussels and Berlin. Yes, but first let's get the finance guys who crashed the economy and the politicians and economists who have continued to strangle it to take some responsibility for what they have been doing. People can believe or disbelieve whatever gets shoved on the front page, but they've had to put up with lower living standards whether they wanted to or not. On a related note, today I saw the recent talk from Michael Dougan, Professor at Liverpool University and career expert on EU Constitution, trade and general operation. In 15 minutes it gave more unbiased and factual information then I've seen either from the media or, sadly from the BBC throughout this whole debate. It really should in my opinion be on a constant loop on BBC news. Much as I hate the press of this country, unfortunately they are the only method we have to keep the "political classes" accountable. They still have a national reach along with TV and can still strike fear into the hearts of the "political classes" as well as pompous celebrities and crooked business people. At the moment bloggers etc have given us a much wider range of information to increase our understanding of complex situations but they do not as yet engender fear in these groups. For ordinary people I have in the past likened the press as a bit like King Kong and Fay Wray, you get picked you up, it breaths it's foul breath all over you, it strips you naked then discards you and moves on. Freedom of the media and speech means exactly that. The main stream media has it's own slant in the other direction. IMHO. Not that it has any bearing on the main point of an otherwise excellent article, but your own piece appearing high in a Google search for UK media bias EU probably has more to do with Google using data from your browsing history and cookies to personalise its results than it does with the lack of other articles about anti-EU media bias.